Almost half of American Democrats want Vice President to challenge Hillary Clinton in 2016 race, finds new Reuters/Ipsos poll. Almost half of American Democrats want Vice President Joe Biden to challenge front-runner Hillary Clinton in the 2016 presidential race, a new Reuters/Ipsos poll published on Monday found. 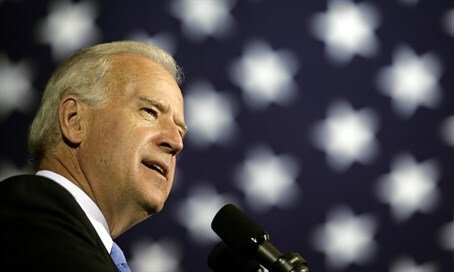 The results come as speculation surrounding Biden’s intentions has intensified, with reports having him close to a decision. The declared Democratic presidential candidates, including Clinton and U.S. Senator Bernie Sanders of Vermont will take the stage Tuesday night in Las Vegas for the first party debate. 48 percent of Democrats surveyed in the Reuters poll wish he were a candidate, compared with 30 percent who said he should stay out, the news agency said. Independents were split on the question, with 36 percent saying Biden should stay in and an equal share believing otherwise. At the same time, just 17 percent of those surveyed said Biden would be their first choice, while 46 percent would back Clinton. Biden would also run behind Sanders, who remains the favorite of one fourth of Democrats surveyed. Former Maryland Governor Martin O’Malley, ex-Senator Jim Webb of Virginia and Lincoln Chaffee, a former governor of Rhode Island, comprise the rest of the Democratic presidential field. Clinton has been perceived as increasingly politically vulnerable as questions persist over her use of a private email server while she was secretary of state in the Obama administration. That controversy has helped stoke the fires for a late-in-the-game Biden shot, noted Reuters. An internal government review has found that Clinton sent at least four emails from her personal account containing classified information during her time heading the State Department. Clinton has apologized for the use of a private email server, even though she previously insisted she didn’t need to apologize because "what I did was allowed." Those close to Biden told Reuters that the vice president, still grief-stricken over the death of his son Beau from brain cancer in May, has not yet settled upon a course of action and is determined to stay true to his personal timetable. Another possible candidate whose name came up recently is former Vice President Al Gore. Reports in August indicated his supporters had started chatting with him about a potential 2016 presidential bid.